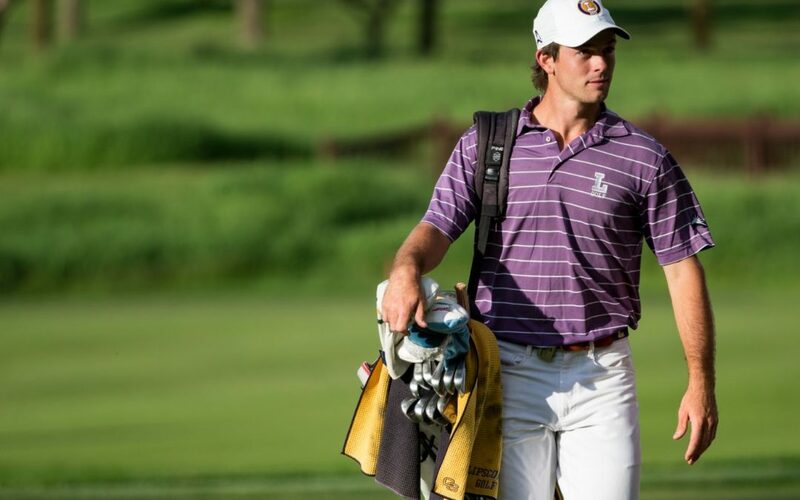 Lipscomb senior golfer Dawson Armstrong knows exactly what he wants to do after graduation. And his plans don’t have anything to do with the Corporate Management degree that he’ll earn in May. Last Friday, Armstrong won the Mackenzie Tour – PGA Tour Canada Qualifying Tournament at TPC Sawgrass in Ponte Vedra Beach, Florida. The victory secured Armstrong’s spot on the 2018 Mackenzie Tour, a professional stepping stone for golfers dreaming of the PGA Tour. The tour includes 14 stops around Canada this summer, with the top finishers granted exemption for the 2019 Web.com Tour – golf’s top development circuit. Armstrong said he hopes to participate in the Web.com Tour in some capacity this season, with dreams of securing his card for the 2019 PGA Tour. Armstrong’s victory did not come easily. He began the final day of the qualifying tournament in a tie for fifth place, but posted a -6, 66 for the come-from-behind win. The Brentwood native capped his performance with a 35-foot putt from just off the green on the 17th hole to edge out fellow Americans Justin Doeden and Christopher Hickman, who finished in a tie for second place. Armstrong said he plans to wait and see how Lipscomb fares in the ASUN and NCAA tournaments before dropping his amateur status. He wants to help the Bisons get back to the NCAA Championship for the second consecutive year, but if that’s not in the cards, he’ll take his talents to the next level in May. “I’m going to stay with the team and try to make it as far as possible, but I’ll be turning pro as soon as our season ends,” he said. His decorated collegiate career has included wins at the 2015 Western Amateur and the 2015 Dogwood Invitational, as well as three appearances in the NCAA tournament. He also earned ASUN Golfer of the Year honors in both 2016 and 2017. Armstrong’s success can be partially attributed to his family bloodline. His father, Dale, played at Lipscomb in the mid-1980’s and made it to the final stage of the 1994 PGA Tour Q-School. Dawson’s two brothers, Dowling and Davis, are also members of the Lipscomb golf team. After golfing as an amateur for the better part of the last two decades, Dawson Armstrong will soon be able to cash in on his hard work. Local golf enthusiasts have at least one more chance to see Dawson Armstrong in a Lipscomb uniform when the Bisons host the Ryman Hospitality Intercollegiate next Monday and Tuesday, April 9 and 10. The tournament will be held at Nashville’s Richland Country Club.